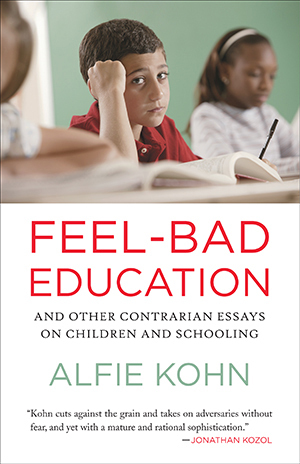 Arguing that our schools are currently in the grip of a “cult of rigor“-a confusion of harder with better that threatens to banish both joy and meaningful intellectual inquiry from our classrooms-Alfie Kohn issues a stirring call to rethink our priorities and reconsider our practices. In nineteen recently published essays-and in a substantive introduction, new for this volume-Kohn repeatedly invites us to think more deeply about the conventional wisdom. Is self-discipline always desirable? he asks, citing surprising evidence to the contrary. Does academic cheating necessarily indicate a moral failing? Might inspirational posters commonly found on school walls (“Reach for the stars!“) reflect disturbing assumptions about children? Could the use of rubrics for evaluating student learning prove counterproductive? Subjecting young children to homework, grades, or standardized tests-merely because these things will be required of them later-reminds Kohn of Monty Python’s “getting hit on the head lessons.” And, with tongue firmly in cheek, he declares that we should immediately begin teaching twenty-second-century skills. The field of education bubbles over with controversies. It’s not unusual for intelligent people of good will to disagree passionately about what should happen in schools. Sometimes these disagreements result from how the available evidence is interpreted, and sometimes they’re due to divergent visions regarding the purpose of schooling or what constitutes an ideal society. But there are certain precepts that aren’t really debatable--that just about anyone would have to acknowledge are true. While many such statements are banal, I want to argue that some are worth noticing, because in our school practices and policies, we tend to ignore the implications that follow from them. It’s both intellectually interesting and practically important to explore such contradictions: If we all agree that a given principle is true, then why in the world do our schools still function as if it weren’t? I’ll identify about a dozen examples of this phenomenon, mindful that it won’t be possible to explore all the specific issues--and more controversial implications-- that are entangled within them. Not so coincidentally, many of these questions anticipate the very topics that are explored later in this book. I should also mention that several thinkers whose work I admire were kind enough to add to my “duh” list. I wasn’t able to use all their suggestions, but many stimulated my thinking about the items that I did include and helped me to reframe them. In any case, the hazard of creating such a list is that “Duh” will inevitably become “D’oh!” as more examples come to mind immediately after it’s sent off to the printer. You, meanwhile, will undoubtedly think of still others, some of which may be even more obvious. 1. Much of the material that students are required to memorize is soon forgotten. The truth of this statement will be conceded (either willingly or reluctantly) by just about everyone who has spent time in school--in other words, all of us. A few months, or sometimes even just a few days, after having committed a list of facts, dates, or definitions to memory, we couldn’t recall most of them if our lives depended on it. The more closely we inspect this model of teaching and testing, the more problematic it reveals itself to be. First, there’s the question of what students are made to learn, which often is more oriented to factual material than to a deep understanding of ideas. (For more on this, see item #2 below.) Second, there’s the question of how students are taught, with a focus on passive absorption rather than active meaning-making: listening to lectures, reading predigested summaries in textbooks, and rehearsing material immediately before being required to cough it back up. Third, there’s the question of why a student has learned something: Knowledge is less likely to be retained if it has been acquired so that one will perform well on a test, as opposed to learning in the context of pursuing projects and solving problems that are personally meaningful. 2. Just knowing a lot of facts doesn’t mean that one is smart. Even students who do manage to remember some of the factual material that they were taught are not necessarily able to make sense of those bits of knowledge, to understand connections among them, or to apply them in inventive and persuasive ways to real-life problems. To cite an old adage (which was also cited approvingly by Albert Einstein): “Education is that which remains if one has forgotten everything he learned in school.” Words like “smart” and “intelligent” are routinely used to describe people who merely know a lot of facts, yet I think most people will admit that there’s a difference. In fact, the cognitive scientist Lauren Resnick goes even further: It’s not just that knowing (or having been taught) facts doesn’t in itself make you smart. A mostly fact-oriented education may actually interfere with your becoming smart. “Thinking skills tend to be driven out of the curriculum by ever-growing demands for teaching larger and larger bodies of knowledge,” she writes. Yet schools continue to treat students as empty glasses into which information can be poured--and public officials continue to judge schools on the basis of how efficiently and determinedly they pour. 3. If kids have different talents, interests, and ways of learning, it’s probably not ideal to teach all of them the same things--or in the same way. It’s tempting to assume that one-sizefits- all instruction persists only because there are too many students in each classroom for teachers to customize what, or how, they’re teaching. This explanation, however, doesn’t quite match reality. First, some teachers manage to adjust the curriculum to the needs of each student quite effectively despite class sizes far greater than would be ideal. Second, many people seem to value uniformity and consistency in teaching--or overlook the significance of differences among students--to the point that a lockstep curriculum and a single set of (usually traditional) teaching strategies are used even when this is avoidable. Lots of teachers will do pretty much the same thing next year that they did this year, even though they’re teaching different students. Many schools insist on “aligning” the curriculum so that what’s being taught in all the fifth-grade classrooms is virtually identical. (The degree of predictability that this arrangement ensures is convenient for the sixth-grade teachers who will inherit these kids, but why should that consideration trump what’s best for the kids themselves) Finally, policy makers mandate a uniform set of standards and curriculum topics for all students of the same age across a district, across a state, and now, it appears, throughout the entire country (see chapter 15, “Debunking the Case for National Standards”). Most of us understand on some level that one size is more likely to thwart than to fit all, yet education policies proceed as if that weren’t the case. 4. Students are more likely to learn what they find interesting. There’s no shortage of evidence for this claim if you really need it. One of many examples: A group of researchers found that children’s level of interest in a passage they were reading was thirty times more useful than its difficulty level for predicting how much of it they would later remember. But this should be obvious, if only because of what we know about ourselves. It’s the tasks that intrigue us, that tap our curiosity and connect to the things we care about, that we tend to keep doing--and get better at doing. So, too, for kids. 5. Students are less interested in whatever they’re forced to do and more enthusiastic when they have some say. Once again, it’s true for you, it’s true for me, it’s true for people who spend their days in classrooms and in workplaces. Once again, studies confirm what we already know from experience (see chapter 6, “How to Create Nonreaders”). The nearly universal negative reaction to compulsion, like the positive response to choice, is a function of our psychological makeup. Now combine this point with the preceding one: If choice is related to interest, and interest is related to achievement, then it’s not much of a stretch to suggest that the learning environments in which kids get to participate in making decisions about what they’re doing are likely to be the most effective, all else being equal. Yet such learning environments continue to be vastly outnumbered by those where kids spend most of their time just following directions. Read Kohn's April 1st post on The Washington Post's education blog, "The Answer Sheet"
Read Kohn's Januarypost on The Washington Post's education blog, "The Answer Sheet"